Our prior post titled “World Recession Update” depicted the percentage of 41 countries tracked around the globe that were printing 1 or 2 consecutive negative quarters of GDP growth. It is easy to view the data presented and come to the alarming conclusion the world is accelerating into an ever-deepening recession and the U.S is bound to follow soon. 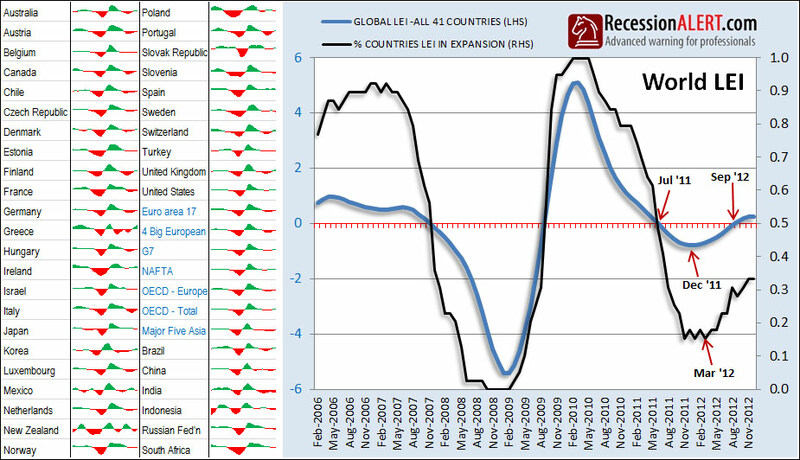 Also, the percentage of countries with positive LEI’s (black line in chart depicting expansion) seemingly bottomed in March 2012. However it is evident that unlike the prior recession, the black line has not zoomed up in tandem with the blue line implying that the global LEI rise only has a few large contributors such as U.S, Canada, Germany, Italy, Australia and U.K to thank for its recent rise. The LEI rebound therefore lacks broad-based participation at this point which is a cause for concern. A long-term version of the chart above that we maintain for clients implies the blue line crossing zero on left axis should be confirmed with the black line crossing 0.5 on the right axis to enable robust inferences on global recession or expansion. Thus, when at least 50% of countries have LEI’s above zero, we can breathe easier but for now this is still white-knuckled riding the rapids “edge of the seat” stuff. Looking at the level of the blue line and that of the black line, a world “double-dip” scenario does not seem out of the question if LEI data does not improve in the ensuing months. The lacklustre performance of the Chinese and Indian LEI’s is especially worrying.